Who says you can't enjoy the benefits of a fireplace outdoors? With a Napoleon 34-Inch Outdoor Fireplace you can have the warmth, style, and relaxing atmosphere of an indoor fireplace right on your patio. The unique Phazer log set provides your fireplace with a natural, realistic look, and the sleek stainless steel front is sure to catch everyone's attention. Best of all, because this outdoor fireplace requires no venting and zero clearance, you can install it just about anywhere. 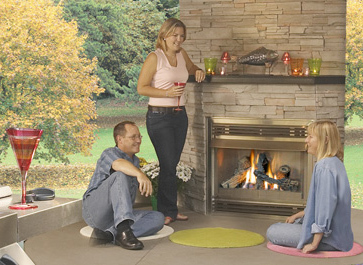 But don't think that you have to sacrifice convenience if you have an outdoor fireplace. Using this 34" model is as simple as using any other Napoleon heating product. Once you've connected your fuel of choice - this fireplace allows you to use natural gas or propane - all you have to do is turn a knob and select your heat setting. You'll even have the ability to do all of that from the comfort of a chair should you decide to purchase the optional digital remote. Whether you want to warm your hands on a chilly autumn evening, host a BBQ, or simply sit back and enjoy and evening by the fire, the Napoleon 34-Inch Outdoor Fireplace offers a way to add a new dimension to your outdoor experience. And because it is efficient as it is remarkable, this is one patio accessory you won't have to feel guilty about treating your family to. How wide is the fireplace opening? Per the manufacturer, the width of this fireplace's opening is 33.5". Napoleon Makes Top Quality Products! I couldn't believe the quality of this fireplace after I finally got it. I can say that Napoleon has gotten a regular customer. After installing this unit (which was very easy) in an outdoor kitchen we made, everyone that has seen it has been asking where they can get it. It really pulls the room together, and the amount of heat it puts out is second to none. As an outdoor fireplace, this unit will fulfill any need you may have. It is rugged, looks really good, and can be cleaned up in a snap. With all the people that are going to be buying this, I hope Napoleon made plenty!